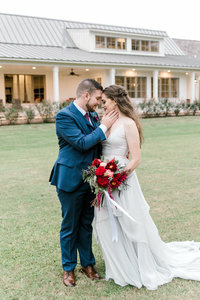 They tied the knot in one of Houston’s hottest AirBnB’s, and I must say from a wedding photographers stand point that it was THE hottest. Every little corner of this quant estate was pure perfection. It played home to the best spots for details, and it let in just the right amount of light for portraits. From the getting ready room upstairs to the outside patios for dinner and dancing, every inch was covered with wedding love. We partied with the couple and 70 of their closest friends and family to the best playlist and yummiest cake. The planning was on point, the food was amazing and I could not stop complimenting Mary on her choice of a gray dress. I mean, be still my heart. That mixed with her bold florals and mix matched bridesmaids dress, and John with is blue suit with guys in gray could grace covers of magazines and made for the perfect wedding party coloring. Not to mention how amazing everyone was, they welcomed us in as part of the family. Reunion meet up anyone?!? Ha! So, without rambling on forever about their wedding, I will let you take a peek into their special day. Show some love for this amazing couple! A big thanks to each and every vendor and family friend that helped make this day so special for the bride and groom. It was certainly a dream team to work with. And congrats to Mary and John, may your years be long and your laughter be strong!! Much Love!